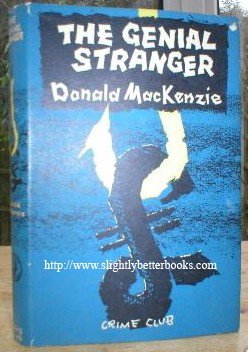 Donald Mackenzie was born in Ontario in Canada in 1908 and was educated in England, Canada and Switzerland. He lived by crime for 25 years and wrote "I went to jail, if not with depressing regularity-too often for my liking." His last sentences were for five years in the United States and three years in England-and they ran concurrently. He began writing and selling stories when in an American jail and says "I like writing and hope to keep at it till I die. I like travel, kippers, American cars, Spanish suits, ice hockey, prize fights, walking, flowers, sun, dogs, Brahms, horseback riding, settling old scores, people who like me. I don't like meat, cocktail parties, Spanish gin, policemen, most judges, talk about things I don't understand, pompous people, good losers, or writers who "spell it out" for you." He further writes "I try to do exactly as I like as often as possible and I don't think I'm either a psychopathic, a wayward boy, a problem of our time, a charming rogue, or ever was." First published in 1962 in Great Britain by Collins for The Crime Club (Collins Crime Club), hardcover with dustjacket, 192pp. In this story, the reader is introduced to two "con-men" He sees every detail of the planning of two confidence swindles, one childishly simple, one elaborate and persuasive. These con-men are professionals, and it is not due to their incompetence or inexperience that events take an extraordinary turn, leading to a situation in which other passions exceed their appetite for stolen money. The action moves from London to Paris, with the danger of exposure to the police never far behind. It reaches a bizarre and complicated climax in Zurich, where at last, after many subtle deceptions and hair-breadth escapes, a crisis occurs which strips the actors of their parts in the confidence charade and reveals the truth. The story moves quickly-it is absorbing and illuminating in its picture of the international con-men at work.